My life completely changed a few years ago after I first experienced the energy radiating from one fierce woman and her innovative endeavor. To tell more about her and her work first requires that I share a bit about the impact she has had in my life. I always imagined my 30th birthday would be a big milestone. And there I was, just months away. While I was excited, I somehow felt empty. A void had been growing for years. I pretended everything was fine; yet, very clearly in my mind it wasn’t. My life felt unfulfilling, yet I was constantly overwhelmed. I felt unloved, despite being married. For 6 months, a Movement Lab gift certificate was tacked above my desk. I looked at it daily—always entertaining the idea, but never making a move. Finally, I showed up. In June 2017, I could tell that my first class at the new(-ish at the time) Movement Lab was the start of something big. I took AntiGravity Fundamentals on a Friday morning and spent the entire weekend raving about it. I walked out of that class feeling spectacular. The workout was unlike anything I’d ever experienced—my body felt fantastic! And for the first time, I was legitimately enthusiastic about fitness and wellness. I knew I had to keep going back. As I did, Movement Lab’s spaces, teachers, and community helped me tap my inner strength. I showed up for class, and then I showed up for myself. I was suddenly envisioning a fulfilling and inspiring life—and Movement Lab helped me see it. 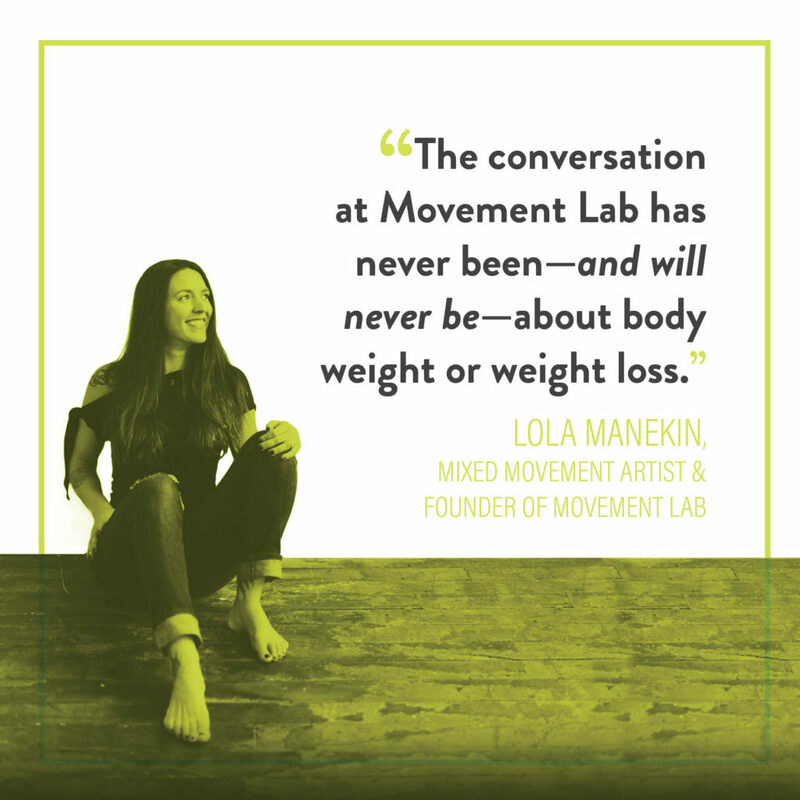 Movement Lab helped me muster the courage to finally make choices with my own best interests at heart. I’m not sure why we seek permission to be ourselves. But doesn’t that sometimes seem the case? That summer confronted me with a troublesome fork in life’s road—one that had provoked me for years. I was drained from investing everything I had into my marriage but with an unrequited devotion. To stay meant I’d likely never know a true partnership with reciprocated love. But to leave meant abandoning the potential for that loving relationship to be with the person I married … the person who I wanted to spend the rest of my life with. In either case, my life would be forever changed. As it turns out, after years of failed attempts to heal my marriage, I knew the answer was to seek happiness on my own. Perhaps I always knew. Yet, it felt like I needed permission to put myself first. Frankly, beyond begrudgingly working out from time to time, I never imagined fitness having much of a role in my life at all, let alone become central to who I am or the choices I make. In the end, nonetheless, my fitness and wellness journey has been the impetus for some of my greatest life decisions. And it’s all thanks to Movement Lab. There, I received love from a group of strangers that was more sincere and unconditional than anything I’d felt in the final years of my marriage. And I was suddenly motivated to do right by myself. I set out on a path to (re)discover who I am. And I have been falling madly in love with my life and the person I’ve become ever since. 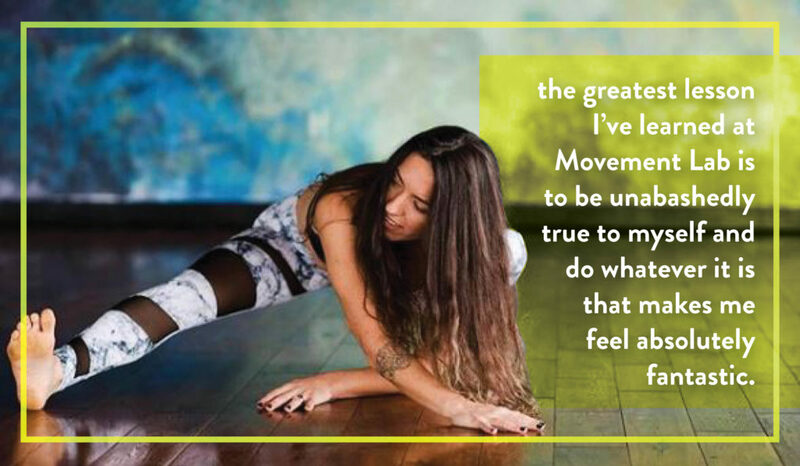 This, I believe, has ultimately been the greatest lesson I’ve learned at Movement Lab: be unabashedly true to yourself and do whatever it is that makes you feel fantastic. After that first class at Movement Lab, my trajectory completely shifted. I began prioritizing my well-being. I embarked on a journey in search of love and happiness. Before long, I found the most wonderful and adoring partner. His love, my newfound strength, and a new perspective helped me survive what came next. 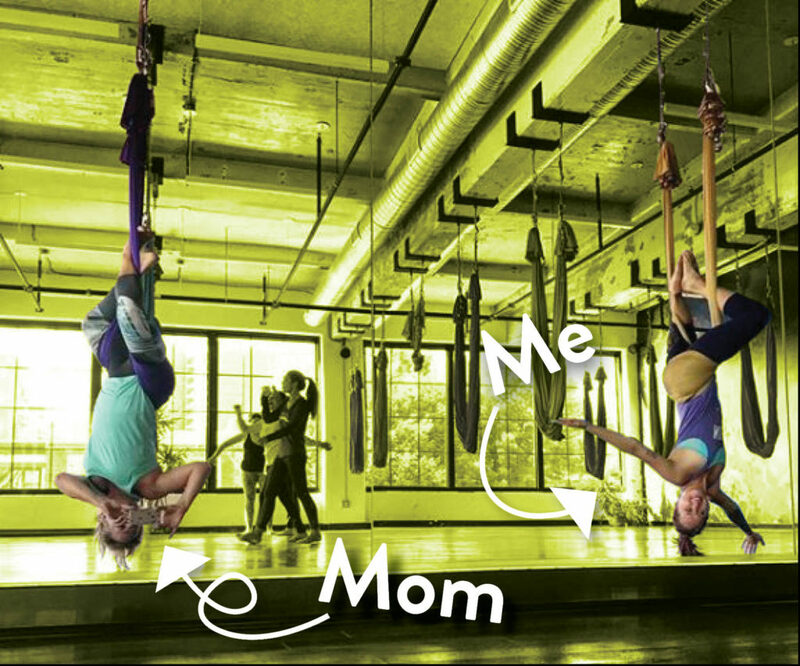 Summer into fall 2017, my mom was joining me for a weekly AntiGravity class at Movement Lab. Our Saturday mornings together became a highlight. I liked the idea of this routine. It was great to see her more regularly, to catch up, and to share in our personal growth. But then, she received some terrible news. My mom has glioblastoma, an aggressive form of brain cancer. No longer could she come with me to class. Making things more provoking around the same time as her diagnosis, my divorce turned horrendously ugly. I was seeing the absolute worst of life­—the cruelest it had to offer—and also the nastiest version of my ex. All while I was consciously challenging myself to be the absolute best version of me. Movement Lab was my refuge when life all around me was utter madness. I kept showing up for class at Movement Lab. In the months that followed, I learned a great deal about myself and who I wanted to be. Which is why I’ve felt compelled to know more about the wonderful woman who created Movement Lab, my new sanctuary. Sitting down to chat with founder, Lola Manekin, I hoped to understand the dream behind Movement Lab. 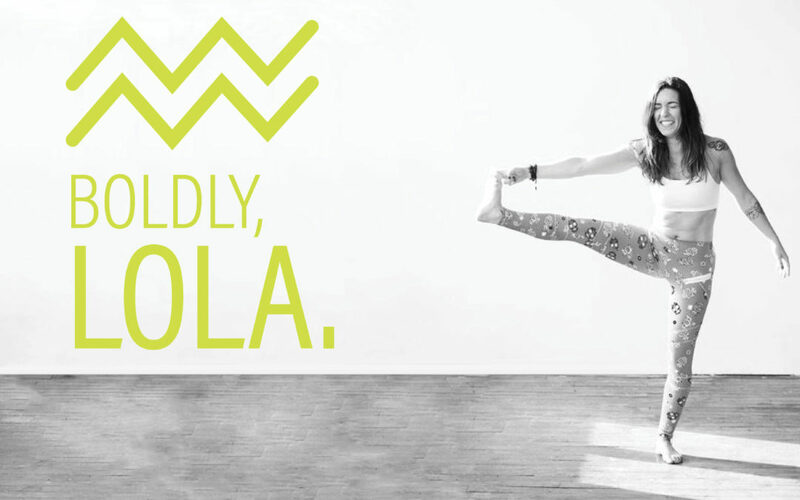 Lola is a bold and assuredly true-to-herself mother of two. In her hometown of Florianopolis, Brazil, Lola first cultivated her passion for movement. She emigrated to the United States in 2004 and moved to Baltimore in 2006. Perhaps it wasn’t obvious at first, but away from home, she was missing the same passion for movement that was so much a part of life back in Brazil. Wanting to reconnect with her body and move the way she had as a kid, Lola discovered and began teaching a creative form of movement called the Nia Technique. Nia wasn’t necessarily new at the time, but it was a new-to-Baltimore form of fitness. Lola worked hard to grow a local Nia community. She taught in shared spaces at first (and with notable success!). At the end of the day, however, she’d want a permanent place to teach. In creative movement, Lola found home again. And with Movement Lab, she built something that would become a second home for so many others. Much like you’d expect from an actual laboratory, Movement Lab is a venue for testing and pushing boundaries. Every class is one you’ll be pressed to find offered elsewhere. There’s absolutely no studio combining as many inventive forms of movement. In a way, I might say Movement Lab’s objective is to stand out from the crowd … to swim against the current … to move to the rhythm of one’s own music. Without a doubt, through her innovative fitness studio, Lola aims to give students a one-of-a-kind experience—but it’s not just for the sake of being different. Movement Lab strives to provide an experience that excites people with playful movement. It invites students to explore their body’s strengths and exert energy in sometimes unusual or even silly ways. In other words, Movement Lab asks us to move like we were kids again. In fact, Movement Lab is not really about physical fitness at all. In her 2015 TED Talk, “Taking Movement Beyond,” Lola recounts her investigation into the word “movement,” which she came to understand as the opposite of being stuck. She saw that life is movement. Everything is constantly changing—there are cycles, seasons—and nothing is fixed. There’s always room for evolution and growth. Indeed, at Movement Lab, fitness may be the result, but it’s never the goal. Students are setting their own personal goals and doing what feels right. Without self-comparison, Movement Lab creates a safe space where students grow together. Lola never sought out to create the family-like atmosphere, she told me, but it certainly evolved. The strength of the Movement Lab family continues to surprise Lola as, time and again, students express their love for the studio and one another. From the outside looking in, this culture of love and support isn’t surprising at all. Encouraging creative expression also invites students to be open and honest. And with a brave, motivated leader like Lola, the masses are surely inspired. Lola is a force. She’s empowering because she’s open and refuses to hide her vulnerabilities. It’s a positive feedback loop, though. Lola feels she can be true to herself because her students give her the space to do that. And because they do, Lola can give her students the freedom to fully express themselves, to experiment, and to try something new. It’s a safe space where judgement is left at the door. As students test new movements and stretch beyond their comfort zones, they start to notice their bodies more. In more ways than one, I’m much stronger today than ever before. I’ve reconnected with my physical body, and with my mind and soul. I say with sincerity that I’ve evolved on deep, emotional level from attending classes at Movement Lab. That said, I never imagined I’d be brought to tears during a workout. Now, I’m proud to say I’ve cried—and not once or twice, but a handful of times—in classes at Movement Lab. If I’m being honest, I must admit that I take at least some comfort in knowing I’m not alone! At Movement Lab, I’ve seen other students cry and I’ve seen teachers cry. Many times. People don’t often associate fitness with vulnerability, but we should. To grow is to develop, to become greater. Usually, growth can’t happen without breaking some barriers. At Movement Lab, I’ve cried tears of sadness, and tears of absolute joy. Joy, explains Lola, is a state that we enter. We don’t emote joy, we feel joy; meaning, we can enter a state of joy regardless of our mood. I’ve attended countless classes while distraught and in pain. Yet, during that hour, I felt indescribably joyful. It’s nutrition for the soul! 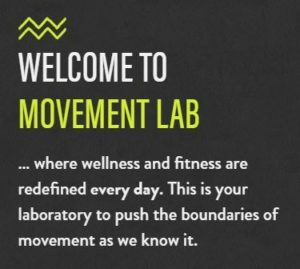 As Movement Lab continues to be a leader in innovative wellness, I wondered what might be on the horizon. Lola sees potential in everything. She’s always asking, “what more can there be?” She asks this of herself, of her students, and certainly of Movement Lab. But Lola isn’t looking to other fitness studios for the answer. Much in the same way that Movement Lab discourages competition among students, Lola isn’t concerned with on-goings at other studios. There’s no animosity toward them, to be clear, she’s just focused on Movement Lab. Besides, there’s no time to compare or look back when she’s always pushing forward. I have no doubt that there are great things in Movement Lab’s future. I feel a devotion to Movement Lab. I almost feel like I owe it something. I say “almost,” because I know it demands nothing from me except to be the truest version of myself. But really, it’s more of an invitation than a demand. No, we don’t need Lola’s permission to live freely. Only we can give ourselves that permission. But sometimes, we just need a strong community with one badass, fearless leader to show us that we can. My 30th year on this planet came and passed, and finally I found myself pointed in the right direction. Finally, I was moving. Finally, I was unstuck. For beaconing me through the darkness, I am eternally grateful to Lola and her sanctuary at Movement Lab.